The Battle of Blenheim is a tactical level two player game covering one of the pivotal battles during the War of Spanish Succession. One player takes the role of Marlborough, commanding the British and Allied forces, and the other of Tallard, leading the Franco-Bavarians. 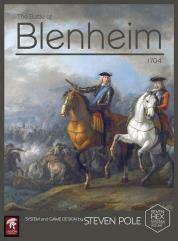 At Blenheim Marlborough found himself confronted by a superior Franco-Bavarian force in a strong defensive position. Like Hannibal's great victory at Cannae, Blenheim was won by the successful implementation of a bold and imaginative plan. The flanks of the Franco-Bavarian forces were pinned by furious attacks at unfavorable odds which denuded their center of troops re-deployed to buttress the hard-pressed wings. Then Marlborough released his cavalry to smash what was left of Franco-Bavarian center and cleave Tallard's army into two. The threat that Louis XIV's France would come to dominate Europe was over.